Spring Break comes in all shapes and sizes, so you skinny sunny vacations shouldn't make fun of our big fat snowy holiday. It's not nice. Don't let the SPRING in Spring Break fool you. 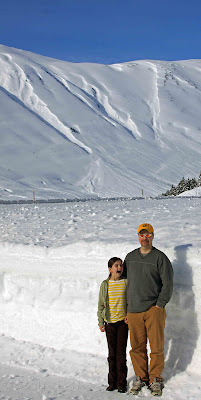 It's still very much winter up here, as you can see by the height of the snow behind my 6' husband and my crazy daughter. 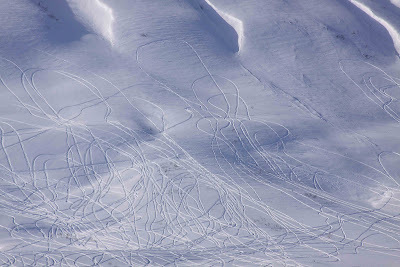 Those are snowmachine tracks on the mountain in the background; here, let me zoom in for you . 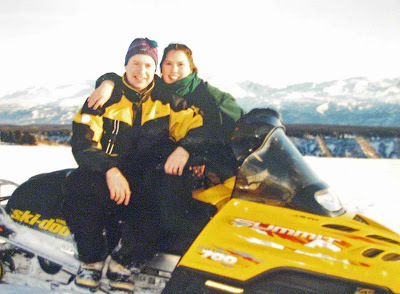 . .
Alaskans love to etch-a-sketch in the snow. That is a lot of snow. You win. All our snow has finally melted so at least it looks a little more like spring over our spring break. Wow, that's awesome. I've never seen that much snow in person. I'm a new follower.